I’m standing on the edge of a cliff with only my toes making contact with the rocks. The only thing that keeps me from plummeting is a thick black rope that’s looped around the clasp of my waist harness, firmly grasped in my right hand to stop it from uncoiling. As I lean back precariously over the edge, the first thought that races through my head is “why did I want to do this again?” I slowly tilt further back until I’m at about a 45-degree angle with the edge. I release my grip on the rope and suddenly the tension is gone and I’m taking my first step, backwards. Up until this point, we had only been doing the typical go-see-and-explore touristy things. But we wanted to change gears and get a little more adventurous. We found ourselves in Da Lat, Vietnam, a great place for the outdoorsy-sporty type with rock climbing, mountain biking, trekking, and canyoning all on the menu. The first 3 options seemed rather run of the mill, but the last one, canyoning, really peaked our interest. 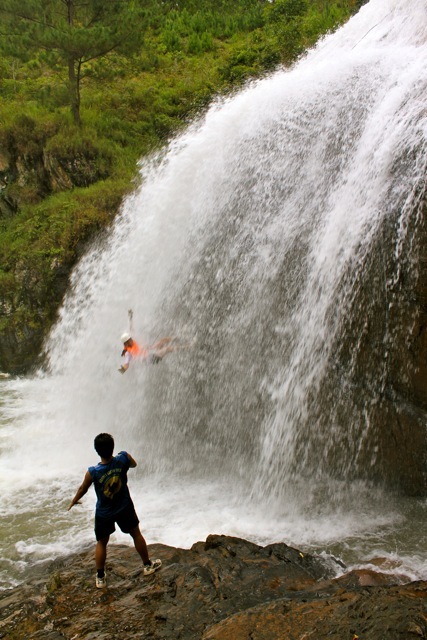 Canyoning is a form of river exploration (that’s situated in a canyon) where you travel down the river using various techniques such as walking, floating, swimming, abseiling (rappelling) and cliff jumping. There is a level of difficulty to the sport and equipment, such as ropes, harnesses, helmets, and lifejackets are required. But with the right tour operator and well planned out route, canyoning is possible for all types; old, young, experienced and beginner. For us, Groovy Gecko Tours was our number one choice. We did some research on the Internet and found they were the most experienced for this type of activity and came with great recommendations from other travelers. Our day started with a bit of a trek down through the mountains and across river streams. After about 20 minutes we reached our starting point. We got into our harnesses and helmets and our guides double-checked that everything was up to code. We were then instructed about how to tie into the rope, (connecting it to our harness) and how to abseil safely down the mountainside. We would be in full control of how fast we would descend; depending on how much pressure we put on the rope and the angle at which the rope would feed out from. But the key would be to never let go of the rope…no matter how panicked you might get. Both Tristan and I were introduced to rock climbing in highschool, and I’ve continued recreationally throughout the course of the past 5 years. We were both a little rusty and the nerves were setting in during the practice runs our guides had us do. But after our third try we were pushing off from the rock face and allowing ourselves to glide down the rope instead of walking down. 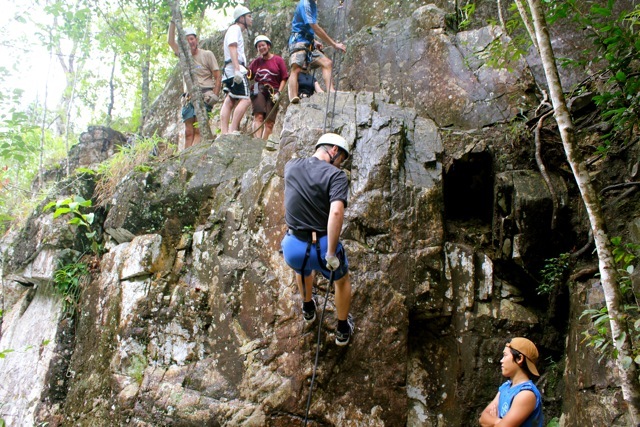 A good-looking abseil should be nice and smooth with controlled pushes and landings against the rock face, just like jumping perpendicularly down a mountain. Our group consisted of a retired couple, a young man in his early twenties, and Tristan and I. We all immediately bonded, probably because we all realized what a crazy and extreme day trip we had signed up for, and were constantly cheering and encouraging each other along. 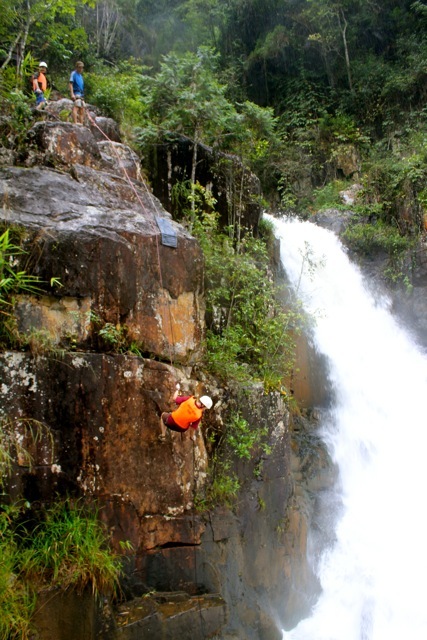 With our hearts racing and adrenaline flowing, we did our first abseil from a height of 18m right beside a gushing waterfall. Since the rainy season was just finishing up, the river was high and the water current was flowing quickly. The intensity of the waterfall really set the tone for the day with the sound of hundreds of litres of water per second crashing on the rocks below. This was going to be one epic day. Our second abseil was from a height of 16m against a dry, flat mountainside, allowing us to perfect our techniques. We ended up right in the river at the bottom and had to wade through the water over to the rest area. Between each abseil we had to either trek through the mountain forest, wade through the river, or simply float downstream. At one point we reached an area where the river dipped down, creating a small water slide effect. 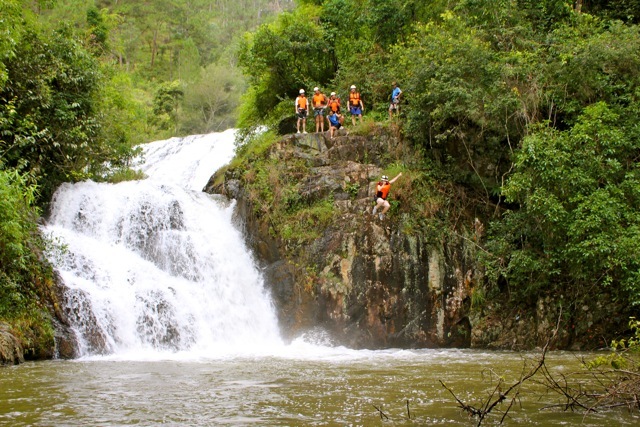 Not wanting us to miss out on some fun, our guides had us seize the opportunity and experience a “natural” water park. Feet first, arms behind our heads, and elbows brought together, we each took turns sliding down the rocks and dropping into the small pool below. After lunch, the extreme-factor got dialed up a few notches. We were to abseil down the front of a 25m waterfall and then free fall the final 6m. The lead guide gave us a few more instructions and some tips in the event we lost our footing and found ourselves caught in the waterfall. Maybe it was some new found bravery, the lunch, or pure stupidity, but I volunteered to go first. I had watched a guy from a previous group do it and figured as long as I could stay on my feet, I’d be fine. With a support rope in place, I walked across the top of the waterfall to where the lead guide was. He attached his secondary safety rope to me and then I tide in. I immediately became well aware of how fast the water was flowing towards me. It was a struggle just to keep my balance at the top, and I was just getting started. With an interesting form of encouragement from my guide (“just go!”), I began to make my way down. It was very difficult to keep my footing. Between the slippery rocks and the pressure of the water hitting my shins, going slowly and basically walking backwards was the best course of action. I could feel my heart pounding and I tried not to look behind me. I was making really good progress, but then it happened. I lost my footing, slipped, and fell down into the water. I ended up turning during the fall, so I was facing out with my back against the water, feet dangling over the edge. From the angle I was at I couldn’t turn myself around, so I started to lower myself instead. I ended up coming right to the edge but got pummeled with water. It was so intense and all I kept thinking was go, go, go! I’ve got to get out of this! I somehow managed to turn myself around and got back up onto my feet, which Tristan said from the top was spectacular…everyone was worried for me. I made it down into the water, but I sure got the wind knocked out of me. I guess everyone took notes, because after me no one had as rough of an experience as I did coming down the waterfall. Lucky ducks. Free falling the final 6 metres. The third rappel was the most extreme part of the day but it was quickly followed up with something just as wild; cliff jumping! We had the option of a 7m or 10m jump. The older gentlemen in our group didn’t think twice and jumped off from the 10m point before the rest of us could decide what we were going to do. But after my previous experience, I was now more apprehensive. I realized though that if I thought about it too much, and hesitated, I’d end up talking myself out of it. So I decided to just go for it and jumped from the 7m point. Tristan on the other hand had a bit more gusto and went for the 10m jump. Our final abseil was from the shortest height of the day, 15m. But what it lacked for in height, it made up for in power. Our guides told us this particular spot had a nickname; “The Washing Machine”. This time we would be rappelling down into the path of a waterfall. We would walk the initial part of the rock face, but then the edge would disappear and we would be hanging freely. The key would be to make sure we kept moving during the free hang stage or else the water would end up pushing and turning us around…like a washing machine. This one went a lot smoother than the previous one; though I think by this point I just wanted to get it over with. When I got to the free hang part I basically just released the rope and slid right down into the water. In that moment, the rope ran out and I was pushed down the river by the current. It was one mixed bag of emotions throughout the day. It was thrilling, scary, intense, and amazing all at the same time. We were a little out of our comfort zones, but that’s what made the day so exciting. I was constantly inspired by the older couple in the group who not only kept up, but actually led the group during a number of stages and showed so much courage and support. By the end, we were all comparing our “war wounds” and laughing about the events of the day. We were pushed to the edge, literally and figuratively, and although at times it was nerve racking, we were so happy and proud that we challenged ourselves and did something we didn’t know we could do. If adventure was what we came for, extreme adventure was what we got! Looking for more on this adventure? 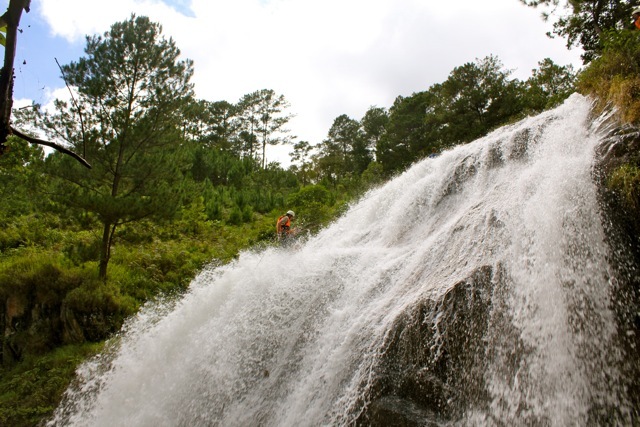 Then check out the video of our day canyoning. You won’t want to miss it! Disclaimer: Our tour was sponsored by Groovy Gecko Tours, but our views and opinions are our own.